AJW were a firm on the edge of the industry who brought in engines, gearboxes and most else to assemble their own package. Production was on a small scale and the best year only produced 250 bikes. The firm's initials came from Arthur John Wheaton, whose background was publishing and for his 1930 range he built lightweights to supplement a big V-twin programme. These had special frames based in part on a triangular principle, but not to the same length as Cotton or Francis-Barnett. The AJW included long engine plates that extended back past the gearbox to the rear wheel and each side was a single malleable casting. Models continued into the 1940s and one way or another into the 1960s. 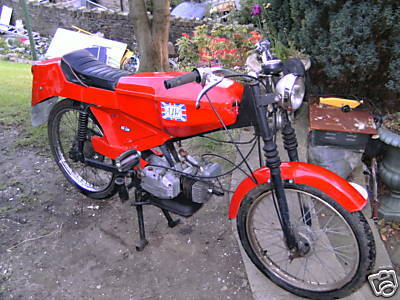 1977 AJW Fox Cub Sports Moped This was the very last model before they closed down, and was manufactured by Chinwood Ltd, of Andover.